Golf Challenge comes with its own framework and heavy duty vinyl canvas. The colorful backdrop, which is designed to look like a golf course, is Velcro receptive, so the special Velcro practice golf balls stay right where you hit them. For pros or novices alike this game can quickly become addictive. This compact, low maintenance, low cost unit will really boost your profit potential. 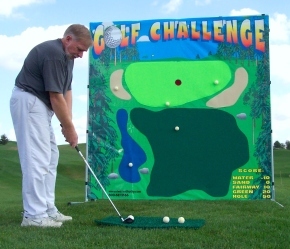 Like all of our games, Golf Challenge can be set up in less than five minutes and can be used indoors or out.